Design Seminar – You’re Invited! 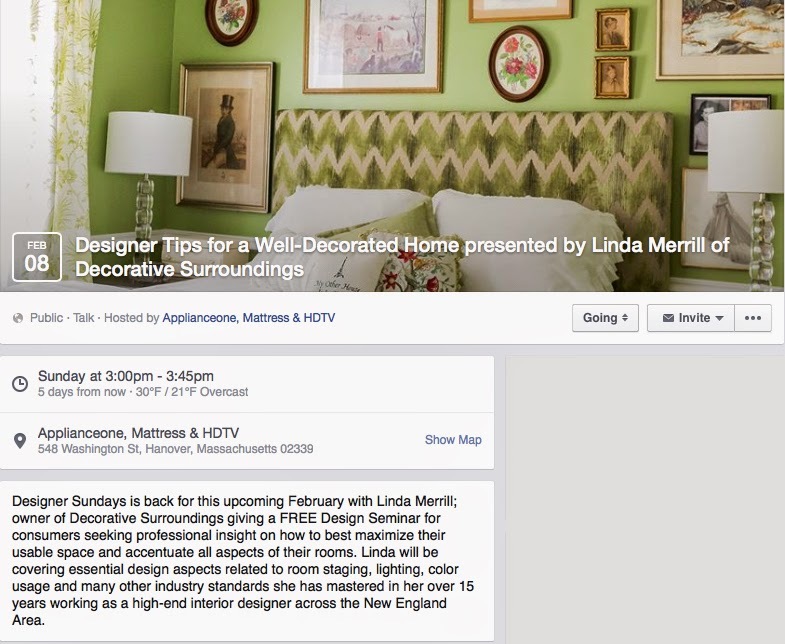 I’ll be presenting a talk on “Designer Tips for a Well-Decorated Home” this coming Sunday at 3:00pm at Appliance One in Hanover, MA. This talk, which is sponsored by AGA ranges, will cover all the small and not-so-small things that can be done to make any home more beautiful and livable. This is the second in a series of “Designer Sunday” talks presented by Appliance One and sponsored by AGA ranges. I’m thrilled to be participating in this new initiative. It’s a great opportunity for homeowners here on the South Shore to come out and learn something new. Plus, you will be able to ask me questions about your specific project and learn more about how I can help you create the beautiful home of your dreams! You can register on Facebook or email me. A local bonus is that the Suburban Boston Home Show is taking place this weekend in Hanover as well. So, come on down and get some great information for your next home renovation project! The Skirted Roundtable: Jamie Drake, Megan and me – live and in person!